SoftExpert Audit is a software designed to help companies manage a broad range of audit-related activities, data, and processes in a single and comprehensive environment. It provides the flexibility to support all types of audits, including internal audits, operational audits, IT audits, supplier audits, risk/control audits, and quality audits. It also provides end-to-end functionalities for managing the complete audit lifecycle – including audit planning, scheduling, preparation, development of standard audit plans and checklists, data collection, execution, reports and monitoring. 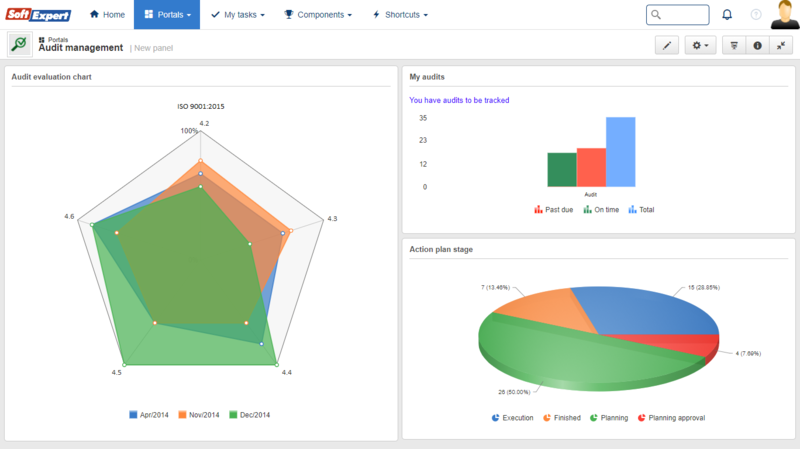 SoftExpert audit management solution also offers advanced resources such as flexible remediation workflows, time tracking, email-based notifications and alerts, and risk assessment methodologies, allowing organizations to implement best practices for efficient audit execution, and ensuring integration of the audit process with the risk and compliance management system. SoftExpert Audit provides the controls required to meet the requirements of international regulations related to social responsibility, governance, quality, environment, and health and safety, such as: ISO 26000, ISO 9001, ISO 14001, ISO 45001, ISO 19011, ISO 13485, FDA and others. Store and manage all of the organization’s audit-related data in a secure, centralized system. Easy and effective management of multiple audits, auditors and audit types. Audit scheduling for an entire year or more. 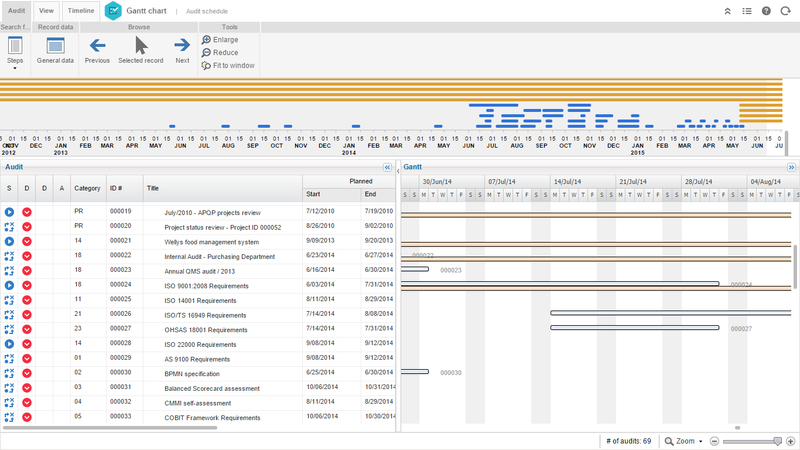 Auditor scheduling based on certification (Lead auditor). Possibility to link auditing tasks to required control activities and risks covered. Processes, areas/departments, products, assets, projects and controls as the scope of the audits. 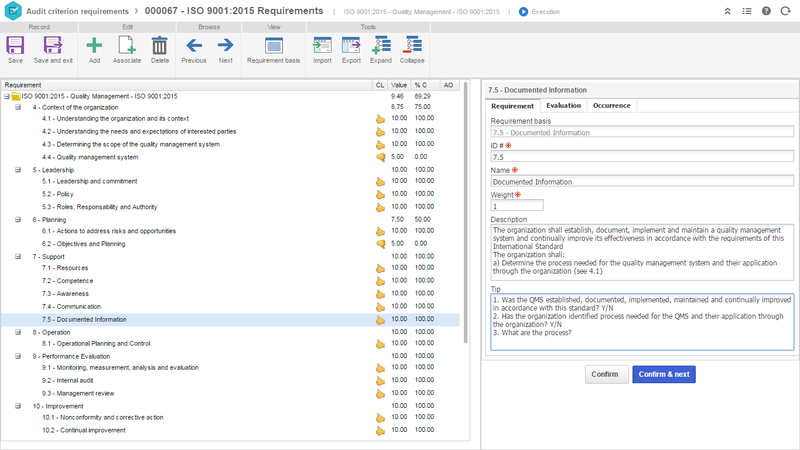 Simplified input of auditing tasks (audit sheets, recommendations and action plans). Enabling operational teams to view recommendations and draw up action plans. Enabling auditors to monitor action plans. 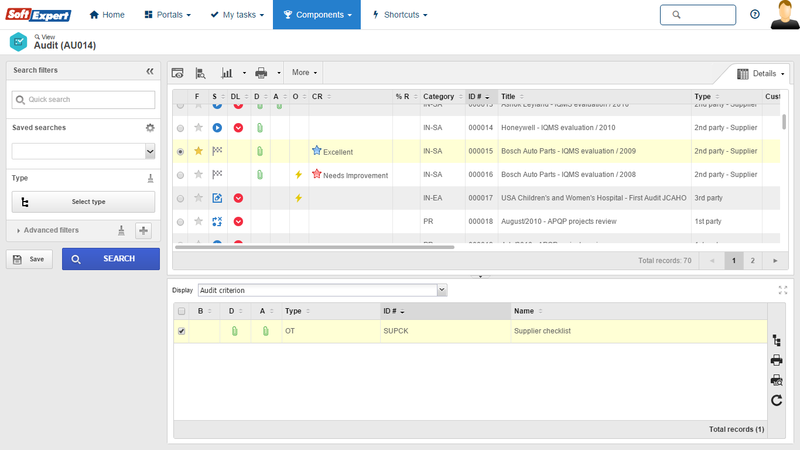 Easily configurable workflow to automate review and approval process. Audit plan assignments are done automatically once the audit plan has been approved. Automatically send reminder notifications to assigned users and escalate to their managers. Download audit checklists to work offline. Full investigation with step-by-step root cause analysis. Attach electronic files or documents involved in the audit process. Evidences, findings, conformity levels and comments for each audited requirement. Best practices, opportunities for improvement, nonconformances, positive and negative points, recommendations, conclusions, results and scores for each audited requirement. Issue audit report including completed checklists and related action items. Automatic online distribution of audit report.